Big data and artificial intelligence? How about data and intelligence? This month has been a bumper one for news stories, articles and exposés about the use of data, big data and artificial intelligence. The coverage has got me thinking. Is it all a liberating licence to become more commercially astute and successful through a greater understanding of the customer or a slightly dangerous cul-de-sac which could take us down the road of knowing more but understanding less? Let’s start off by thinking about Big Data. At its very core, big data is the recognition that there is so much information (data) out there, that traditional technology is no longer sufficient to analyse it all. Today, purchases frequently involve a number of different interactions – through search engines, web sites, via a call centre, in person, using mobiles and through 24/7 social media. Multiply this by one company’s prospects and customers and the amount and depth of information is seemingly endless. Big data technology should turn all this into manageable and actionable information. The opportunities are great and it will mean there’s no excuse for not being great marketers – after all, we’ll know everything and so will be able to achieve anything. But is anything actually good? The problem is that the more data we have and the more we use sophisticated technology and algorithms to analyse it, the more we believe the analysis and the less we use our own intelligence to make sense of what it means, to use the nuances which humans can understand but machines can’t. 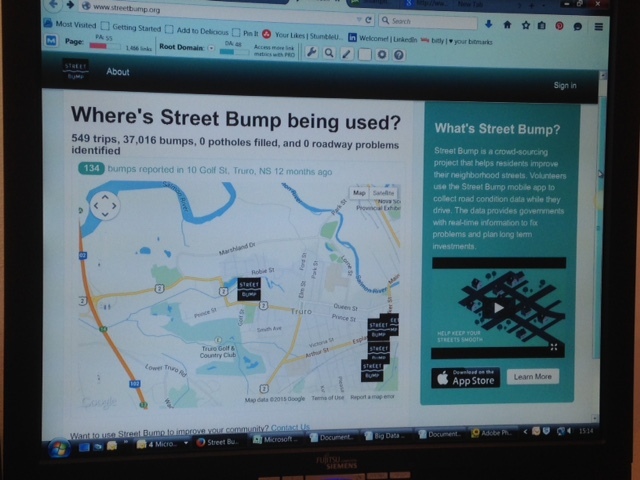 Take the street bump in Boston, an app which will transmit the state of the road surface back to the city corporation who can work out where the potholes are and where the repairs are needed. Sounds great. The problem is that as these apps tend to be used by affluent, educated and young middle class drivers and the potholes are more likely to be repaired in the areas in which they live and drive. So if you live in the wrong area and are not pot hole app ready, then say goodbye to the pothole repair man – he’ll be on the other side of town because that’s where big data has told him to go. It brings to mind my recent experience of buying a brand new car. Good make, good car, smooth transaction. All fine until a few days after purchase when the data users and gatherers got to work. I’ve been plagued by a non-stop flood of letters, emails, phone calls, all trying to find out more about what I thought of the brand, the service, the dealership, the engineering etc. If I don’t quickly reply to the latest communication, it’s normally followed up by another letter or email. The manufacturer is obviously trying to mine every possible piece of information it can about me and my interaction with its dealership and, of course, the car. The more they find out the more sophisticated they can become, the more they know about me, the more they can tailor their offers. But it’s not quite following the script because amidst all these “interactions” are also a regular stream of emails from the manufacturer and dealership advertising their latest fantastic offers on new cars! Oops, I thought I’d just bought a new car but no, the data is telling them that on the one hand they need to interact to discover my post purchase feelings and on the other they want to sell me (another) brand new car. Data overload? You decide. Will artificial intelligence revolutionise the way we work? Which takes me on to Artificial Intelligence. It’s quite interesting typing “artificial” into Google. In first place is grass, second flowers, third intelligence just ahead of Christmas trees. So now we know that plants are more important than progress! Artificial intelligence could well revolutionise how we work and live. At work it’s already pretty apparent that the next 20 years will see all sorts of semi-skilled jobs replaced by semi-skilled machines. Replacing the personal assistant with the smartphone has already begun. And even our personal road space could change. 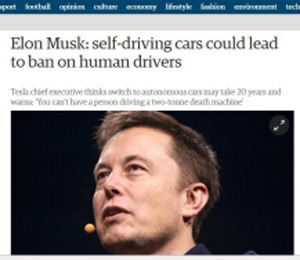 According to Teslar Chief Executive Elon Minsk (Guardian 18 March 2015) driverless cars will spell the end of self drive ones which will just be “ too dangerous”. Recently, a new article from the journal Computers in Human Behaviour (March 2015) concluded that “people typically forego effortful analytic thinking in lieu of passed and easy intuition” which suggests that individuals may allow their smartphones do their thinking for them. Now we could say this is a good thing. Why should we bother thinking when artificial intelligence could do the thinking for us? Well, artificial intelligence is likely to have downsides as well as upsides. Just as big data might get in the way of nuanced interpretation, so artificial intelligence might get in the way figuring things out, that very human trait. Artificial intelligence creates artificial conclusions? So what’s all this got to do with the world of marketing and business? After all I’m neither a sociologist, psychologist or social scientist, just someone who earns a living out of consistently focusing on understanding the world of the customer and, in doing so, hopefully helping to create a better place for both consumers and producers. And that’s the big issue. The link between big data and artificial intelligence is that we might so rely on artificial intelligence to help analyse our big data that we won’t quite understand what it is we’re analysing – artificially intelligently developed data and artificially intelligently developed conclusions produced by technological processes which will know our customers and potential customers better than we ever can. Or so they think. And the result? Interactions, offers, propositions which owe more to algorithms than human experience and intuition. Nothing, or everything is left to chance. The question is, by the time it’s all happened will we be intelligent enough to realise? Market Echoes can help you make sense of how to really develop your customer relationships. A very burning question highlighted along with useful insights. AI has been used in several different ways to facilitate capturing, structuring and analyzing big data for key insights. Focus of all efforts being learning history, analyzing current demographics and forecasting and shaping future. Bloomberg uses big data and AI algorithms for trends analysis and financial forecasts and as such this is utilized by supermarkets, financial institutions, weather forecasts, army, defense and many other sectors. Evon Musk (CEO Tesla) in his words says that “pioneering on AI is like calling the daemon” to which Bill Gates agrees in his press coverage in Washington “Ask me anything”. As we proceed in generational complexity of daily life, the expectations for the demographic detailing increases along and this is a big reason why we sometimes overflow with information. And thus now, much attention is being made to make intelligent and robust automated thinking regime and deploying this to machines. To the dangerous side of which, more than customer loosing interest in the product or service or employee loosing interest in logical innovation, we witness competitive wars of technology frameworks to build future machines that are highlighted to make things easy but same time as an individual we loose logical thinking and rely on machines to do thinking tasks for us. Thanks for your thoughtful addition to the BD/AI debate. Will people or machines or both win? To add to this thought, with AI we have already evaded humans within some part of banking sector to introduce Virtual banking. Up-till now, it still seems in our hands to get used to technology or direct the advancement of making them. 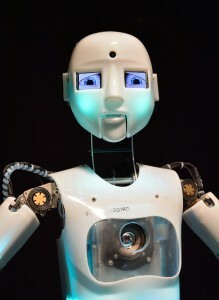 Although, computers understand binary only (0 or 1) but if interfaced with human thinking mechanism along with continuously improving recovery and emotional scenarios, their power may go beyond imaginations. Their might be a time to build a machine to govern other machines. In future, we might take a step ahead by completely automating the air flight piloting and maintenance due to increasing incidents due to human errors. History reveals that technology were never revoked and moved backwards to legacy and thus it is evident that machines are now more strong and intelligent. Really hard to say that one of them (humans or machines) will hold autonomy till the governance of advancement is managed well. An issue is – what is the new definition of a “smart marketing boy” ? You’ve probably read it but if not suggest you try Thinking, Fast and Slow by Daniel Kahneman (Nobel prize winner) for fascinating insights into algorithms and lots more about how we function. Excellent article! It has been a long winter here in Boston- that pothole app could be gold in many neighborhoods! Thanks for your comments. You obviously live in the wrong neighbourhood! Great article Mr. Julian. You present the grey side of AI/Big Data which is quite thought provoking. Interestingly the Google search which gets “grass” over “intelligence” highlights intelligence based on higher probability rather than higher value/sensitivity. Makes me believe artificial intelligence can not replace human intelligence in totality. Thanks for your comment. The balance between human and artificial intelligence is one for long term debate! To download your copy of the file, simply complete the form below. Thank you! Please click here to download the file. To download your copy of the book, simply complete the form below. Thank you! Please click here to download the book.